FACT 1: Blackjack (depending on rule variations) played optimally is a small house edge game. 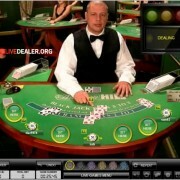 FACT 2: The above holds true for live blackjack – the majority of games reviewed on this site have a mathematical house edge of around 0.5% if played optimally. FACT 3: The vast majority of blackjack players simply DO NOT play optimally. This is evidenced by audited return to player rates for blackjack games as low as 97%, rather than close to 99.5% (where they should be). FACT 4: Playing strict basic strategy (ie optimal playing strategy) is NOT DIFFICULT – particularly playing live online. Quite simply, the work’s already been done for you. 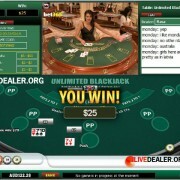 Blackjack is quite possibly the most analyzed casino game in the world. For every possible rule variation and shoe size combination offered, experts have already constructed basic strategy cards or charts that tell you exactly what play is best for every possible deal scenario. You don’t need an in depth knowledge of the game. You don’t need a photographic memory. You don’t even need any numeracy skills to speak of. All you need to be able to do is read the card and make your play accordingly. b) the deals are typically slow, so you have plenty of time. I guess what I’m trying to say here is that you really have NO EXCUSE not to play perfect basic strategy when you’re playing online. This is the correct chart to use for Evolution Gaming , Playtech, and Microgaming casinos which covers a good proportion of available live blackjack options. Simply print out this card and have it sitting handy while you are playing the game. Match the hands dealt in the actual game to those on the card and the intersection is the basic strategy play (key at bottom). Intersection of ‘Your hand’ 17-20 and ‘Dealer’s face up card’ 9 is S=Stand…so you stand. Just follow the card (STRICTLY) and you’ll be richer for it! There really is no excuse for playing blackjack without studying and applying basic strategy to the game in order to get over the house odds.